Sometime around midnight a knock came on my window, "Hey, a guy out here says we can't camp here and have to leave." Six of us were parked off Trails End Camp Rd near Parker Dam on the Colorado River. Much of the property around the aqueduct route is owned by the LA Dept of Water and Power, the dreaded DWP. They appear to be the richest, most powerful utility in the state, if not the country and are very protective of their property and equipment, even a small stretch of dirt off the side of a lonely road. Though the small lot was unsigned, we were in no position to argue - I'd guess it wouldn't take him long to fetch the San Bernardino County Sheriff should he require it. Arguing with the private patrol agent seemed pointless since we didn't really know where DWP lands ended and BLM began. And so our caravan was roused from its deep slumber on a cold, moonless night - engines came to life, headlights ablaze and after a short consultation we headed north a few miles to find a yet lonlier stretch of road where we could spend the rest of the night in peace. We found it on the dirt portion of Trails End Camp Rd, off a utility spur road. Thankfully, we were left undisturbed the rest of the night. Come morning we were up before 7a and getting ready for more peakbagging fun. Or most of us, anyway. Evan was showing off his enormous camera lens in a game of Mine's Bigger Than Yours, and planned to go birding instead of hiking. Laura's clutch had started acting up the day before and she was afraid she might not make it home to Bishop before her Element gave up the ghost. So rather than join us for the second day as planned, she decided to head home early in case she ran into trouble. The remaining four of us squeezed into Tom's Jeep and headed north to continue our quest. The day's agenda had four summits along Trails End Camp Rd with more than 900ft of prominence. Like the day prior, the agenda was a little too ambitious, but we still managed to have an excellent time of it. Our first stop of the day was the lowest peak on the weekend - less than 2,000ft of elevation but still sporting more than 900ft of prominence. Peak 1,860ft juts up quite unmistakably from its surroundings, a mere 1/3mi from the road. We stopped to take a photo during the drive and examine its east side for an ascent route. Like most of the peaks in the area, cliffs offer abundant obstacles on most sides. We drove closer, parking at the nearest approach point and studied the East Face once more. There seemed to be a series of zigzagging ramps, not entirely obvious from below, that might work. As usual, I was the more optimistic of the bunch, Tom the least optimistic, Karl and Patrick falling somewhere in-between. The route proved a good one. The ramps worked as hoped with some moderate route-finding to keep things to class 3 or easier. The hardest section was on excellent rock up a dry waterfall about halfway up the face. At another class 3 section higher still, Karl and Patrick took alternate variations to the right but we all arrived at the summit ridge around the same time. Once there, it was a short scramble south to the highpoint, taking under an hour's time. The summit has a fine view of Lake Havasu and Lake Havasu City to the north, while the southern view was dominated by the higher Peak 2,860ft where we would head to next. We looked around but found no register before heading back down via the same route. 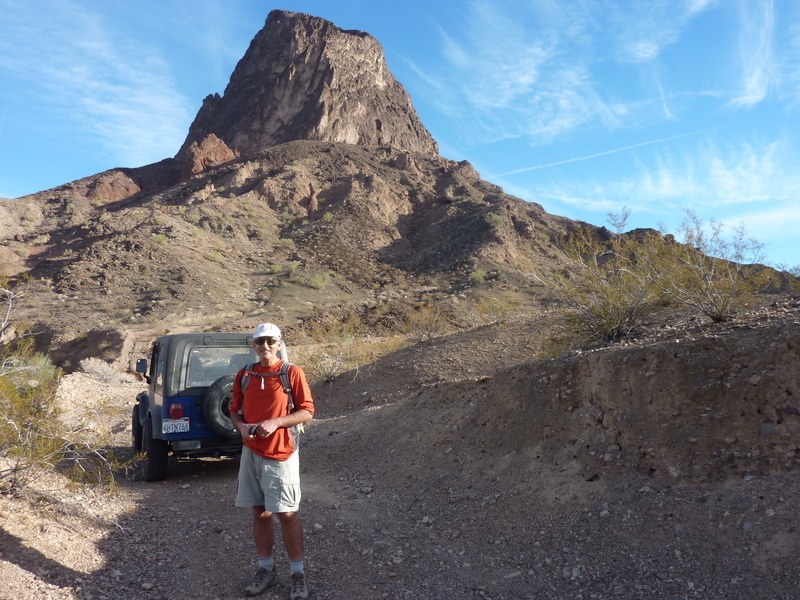 It was 9:15a by the time we returned to the Jeep for a total time of 1hr45min. Peak 2,860ft is the second most prominent summit in the Whipple Mtns after the range highpoint. It lies less than two miles south of the day's first summit. We used a side road off the main access road we'd traveled in on, signed for the Cupcake Mtn Trail (we were curious about this named summit that doesn't appear on the topo maps, but would not find out until we'd returned home). About a mile in on this utility road we parked at a saddle near the closest approach to Peak 2,860ft. Once again, cliffs appear to dominate the peak but this time there looked to be two possible routes. Between these two summits is a saddle with what looks like a break in the cliffs just left of the low lowpoint when viewed from the north. On the far left (east) side of Peak 2,860ft it looks like one might be able to scramble up steep slopes to gain the East Ridge at the base of the cliff band. Neither route looked like a sure thing from the distance we observed them and there was some discussion on which route to attempt. If one way didn't work, it would be a long haul across the north side of the mountain to reach the other. For reasons I didn't elaborate on, I decided we should attempt the left side route. I wanted to visit both summits but didn't mention this when we started. I figured if we went to the right side route at the saddle and found it didn't work, we'd do the left side route and then take the East Ridge to the summit. But knowing the saddle route didn't work, I would be hard pressed to get the others to traverse to the second summit, then back again over the first summit to descend the way we came. On the other hand, if we did the left side route and it didn't work, the saddle route would be no big deal to reach both summits. And if we got up the left side route to the higher summit, the saddle route would be unknown still, thus making it easier to sell the traverse to the bonus peak. I might have had a hard time spinning this bit of deviousness in a more positive light which is why I kept the explanation to myself. As it turned out, both routes worked, though not as easily as we might have hoped. We spent an hour to reach the top of the class 2 portion of the left side route. Ahead of the others by a short margin, I went right up a loose dihedral with a bit of sketchy class 3 that I couldn't recommend to the others. Tom found another route up to the left that was easier while Karl explored another alternative even further left. Karl's route didn't work and somehow he misunderstood Tom's positive take on his own route and decided to abandon the effort and turn around before getting in over his head. Patrick followed Karl's cue and also turned back while Tom and I were wondering from above what had happened to them. We decided to continue to the summit which proved pretty straightforward class 2 along the East Ridge, arriving around 11:15a. We waited almost 30min for them to appear but they never showed along the stretch of the East Ridge visible from the summit. We guessed they'd probably turned back, so off we went to the second summit. On our way past the saddle I paused to check out the other route and was happy to see that it was even easier than the first. I called Patrick on the phone (not sure why we didn't think of this at the summit) and told him this second route would easily work. At first he didn't want to use it, thinking he would hold us up too much, but I told him we were heading to the second summit anyway. He commented that Karl was ahead of him and that he'd try to catch up and see if Karl might join him. In the end they decided not to deviate from their return course and would get back well ahead of Tom and I. We reached the top of Peak 2,562ft before 12:30p, looked around for other routes to these summit (the south side appeared easiest, but it would make for a much longer return), again found no register, and returned back to the saddle. Only about 20ft of class 3 was required on this easy route through the cliff band. Like the previous day, we traversed the base of the cliff band made easier by use trails formed by burros and sheep. Once over to the proper drainage, we descended a shallow ridge to the north and joined the others around 1:40p. By now it was obvious that we would't get to the other two peaks we'd planned for the day, but we could still get one of them. Karl decided to call it a day and start driving south to Blythe where we were to meet up with Evan at the end of the day. Tom, Patrick and I headed for the last summit. We returned to the pavement and parked just off the road about 2/3mi northwest of the peak, discovering a very serviceable undeveloped (free) campsite on the south side of the road at the mouth of a wash heading south. We followed a burro trail south up this wash for about half a mile before turning left and heading east up the west side of the peak. Most of this side is class 2, steep and somewhat loose until near the summit ridgeline where a short bit of class 3 on good volcanic rock leads to the top. This was the closest summit to Lake Havasu we'd visited and consequently afforded the best views looking north and east. A large cairn marked the highpoint and held the only register we'd found on the day. It consisted of a single page covering 15yrs. Our return was a slight variation of the ascent route, passing by one of three saguaro cacti that we had seen today - it has been said that they don't grow on the CA side of the river but that obviously isn't true. Still, they seem to be exceedingly scarce. We took 2hrs on this one, finishing shortly before 4:30p, having used up most of the available daylight.